As the Icebreaker at TSMP quickly approaches; some big names have filed last minute entries. Two-time defending ACT champion “The Punisher” Wayne Helliwell, JR has filed entry with his Bruce Bernhardt Motorsports ride. The duo has turned heads on just about anything they’ve been a part of on the racing scene, and the GSPSS is no exception. Helliwell, JR picked up the win last year at Riverside Speedway in Groveton, NH in dominating fashion, holding off the aforementioned Gelinas for his first checkers in the series. “We have a brand new car, so we will be shaking the car down at the Icebreaker,” Bernhardt says. “However, we don’t attend a race we don’t think we can win.” Helliwell is more reserved about the first race of the year. He comments, “We want to take it step-by-step. We would like to get a good practice in and work the bugs out.” Helliwell will be running a limited schedule in the GSPSS, as the Dover, NH driver will be turning “Outlaw” in 2014 by running partial schedules with the Pro All-Star Series, ACT, and GSPSS. Other big names that will be attending the race are Matt Frahm and Tommy O’Sullivan. Frahm, the career wins leader in the GSPSS with 4, will look to pick up number 5 at the Icebreaker. The former Nationwide Series driver finished 12th in this race one year ago. O’Sullivan, brother to 2013 champ Mike, finished third in the World Series at Thompson in 2013, and looks to start the year off on the same note. Thompson Speedway Motorsports Park is located at 205 E. Thompson Road in Thompson, CT. For more information at the track, please visit www.thompsonspeedway.com. For more information on the Granite State Pro Stock Series, contact Mike Parks at mparks@gspss.com or visit www.gspss.net. 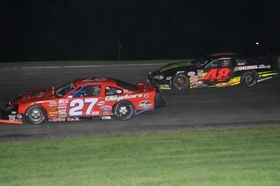 Entries for Thompson Speedway Motorsports Park opener now include Gelinas and Helliwell.